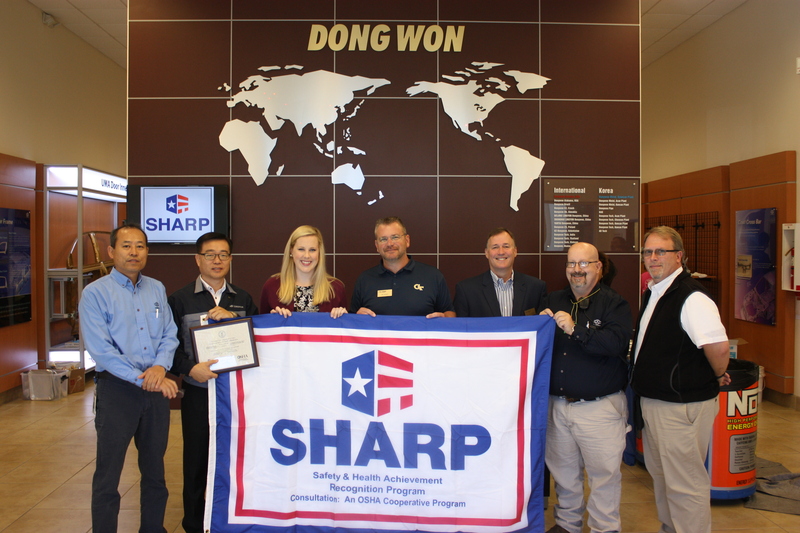 Dongwon Autopart Technology celebrates its SHARP status. From left: Tony Yun, general manager; Charlie Kim, president, Dongwon Autopart Technology; Neely Bridges, SHES research engineer; Jim Howry, SHES principal research associate; Paul Schlumper, manager SHES’ Georgia Onsite Safety and Health Consultation Program; Larry Rogers, Dongwon safety and general affairs manager, and Kevin McKinsey, head of procurement, Kia Motors Manufacturing Georgia. For the past three years, the Safety, Health, and Environmental Services (SHES) program, has been working with Dongwon Autopart Technology, a Korean maker of door frames, bumpers, and side impact beams and supplier to Kia Motors’ plant in West Point, Georgia. Based in Hogansville, Georgia, Dongwon, which opened in 2009 and employs 200, sought to reinforce the plant’s health and safety practices. 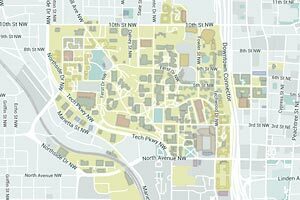 As a result of its work with SHES, a program of Georgia Tech’s Enterprise Innovation Institute, Dongwon was granted Safety and Health Achievement Recognition Program (SHARP) status October 18. The designation is awarded to those companies with fewer than 250 employees with injury and illness rates below industry average and that have an effective safety and health management system in place, said Paul Schlumper, manager of SHES’ Onsite Safety and Health Consultation Program. SHES staff worked with Dongwon onsite to help the company’s management and staff better manage safety and health conditions and help it reduce expenses by improving those standards, Schlumper said. Because of the SHARP designation, Dongwon, now one of only 10 Georgia companies with that status, is exempt from certain federal OSHA inspections for up to two years, Schlumper said. “It’s a recognition that Dongwon is a high performer in safety and health and a differentiator that the company can show to its customers and suppliers,” he said. The SHARP status is already making an impact, Rogers said, explaining the company has been fielding calls from other Kia suppliers that want to learn more about the certification process and SHARP best practices.